Have you ever had your heart set on eating delicious waffles but you only have pancake mix in the kitchen? Are pancake and waffle batter the same? What really is the difference between pancake and waffle batter? And can you make waffles with pancake mix? Well, get ready to find out! To begin bluntly, no, pancake and waffle batter are not the same. While looking quickly at a waffle batter recipe and a pancake batter recipe, you will notice that the two share many ingredients, but look closer and you will see important variations between the two. 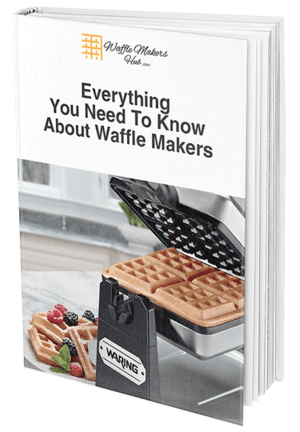 Never fear, though, in this article I will show you how to make waffles with pancake mix! If you are looking specifically for how to make pancake mix with Bisquick, as many people may be, our blog post about using Bisquick will help you for sure! For one, waffle batter recipes tend to have more sugar and also more fat (maybe that’s why they are so delicious…). Extra sugar in waffle batter helps the waffles become a beautiful golden brown. While the waffle batter is baking in the waffle maker, the sugar is caramelizing. Premade pancake mix will probably not have the amount of sugar needed to make golden brown waffles. The higher fat content in waffle batter vs. pancake batter helps the waffles get their delicious crispy outside. While pancakes are soft and floppy, waffles have a nice crispy outside with a soft inside due, in part, to the extra fat. If you are making waffles with pancake mix, you will need to add some extra fat which we tell you how to do later. When making a waffle batter, a thicker consistency will make much better waffles. Pancake batter tends to be thinner and runnier. Waffle batter is not supposed to be runny! With pancakes, that consistency is okay as the pan will contain the batter but a runny waffle batter might just run right out of the waffle maker and make a big mess. No thank you! When making waffles with pancake mix, you may need to add a little extra mix to thicken the batter. So what if you already made pancake batter but you really want to make waffles? Can you use pancake batter to make waffles? If you were to pour pancake mix straight into a waffle maker, you might be disappointed. First, the loose pancake batter will probably pour out of the sides of the waffle maker so be prepared for a messy breakfast! Next, the batter is likely not going to turn the nice golden color that you are looking for in a perfect waffle. When you go to remove the waffle made with pancake batter from the waffle maker, it will probably be soft and bendy. While it make have the same shape (thanks to the waffle maker!) and even smells as delicious as a regular waffle, it will not be nearly as good as a true waffle. But wait! There is a solution! There is a way to make homemade waffle batter from a pancake batter recipe. As I mentioned before, waffle batter has more sugar and fat than pancake batter so to make some great waffles from pancake batter, we will need to increase these two ingredients. First, we will tackle the additional fat needed to make nice crispy waffles. Whatever the quantity of fat in your pancake recipe is, you are going to want to double it! So say your pancake batter recipe calls for 2 tablespoons of melted butter, simply add 4 tablespoons of melted butter instead! Bye bye pancake batter, you are on your way to beautiful waffles! Next comes the additional sugar. We want our waffles to be a beautiful golden brown so to convert the pancake batter into a waffle batter recipe, you should use 2.5 times the amount of sugar. If your pancake batter recipe calls for 2 tablespoons of sugar, you should use 5 tablespoons of sugar instead. Crispy, golden waffles are on their way! Say you are not making your waffle batter from scratch but you want to use a pancake mix to make waffles. You have pancake mix already, but you just…. want….waffles! This is another easy task! While many pancake mixes may already have instructions on how to use the mix to make waffles, the simple recipe below can be used to make waffles with pancake mix. -Using a whisk, beat the eggs, vanilla extract, whole milk and melted butter in a medium-sized bowl. -Whisk in the pancake mix and continue to whisk until there are no lumps in the batter. -Allow the batter to sit for 5 minutes to let it thicken. -Pour into your preheated waffle maker and cook according to the manufacturer’s instructions. Enjoy! Now you know how to make waffles with pancake mix! It’s so easy! So next time you find yourself with just pancake mix but all you truly want are some amazing Belgian waffles, don’t worry! You are now ready to get cooking! If you are still feeling hesitant or want a live demonstration, I recommend this video from Angie’s Southern Kitchen. Which Pancake Mix is the Best for Making Waffles? Now you may be thinking, why even buy separate waffle mix when you can just make waffles using pancake mix? Why not buy just one type of mix to have at home? Well, you can definitely do that! A great standard mix that I recommend, which can be used for both great pancake and waffles, is Aunt Jemima Pancake and Waffle Mix, Buttermilk Complete. All you need to do is add water and your mix will be ready to go (this mix is also without milk so it is a great dairy-free option!) Bisquick pancake mix is also a good one to keep around to make waffles and Bisquick even has a great gluten free mix you could try too! If you prefer to make waffles from pancake mix with a heartier and healthier product, try Kodiak Cakes Power Cakes mix. This mix is all natural and non-GMO, made with whole grains and has added protein to start your morning right. Now that will make some delicious, healthy waffles! You also do not need to add milk to this mix, just simply add water, which makes the morning breakfast routine even easier. While there are so many great waffle recipes that work fantastically, the next time you find yourself thinking about making waffles out of pancake mix, go for it! You can make some great waffles using pre-packaged pancake mix or also with any from-scratch pancake recipe. Time to get out that waffle maker!